You’ve just landed in a new city. How do you escape the tourist traps and experience the real thing? So, you’ve just arrived in a new city and want to dive into its culture. Where to start? Here are four rules I’ve picked up for fully embracing and immersing yourself in any bustling new metropolis. Staying in a five-star hotel with 500 rooms, in a seaside resort encircled by three-metre-high walls or anywhere kilometres away from the nearest town simply reduces your chance of meeting locals. Except for the hotel staff, who probably speak flawless English. Viable and inexpensive alternatives would be small, locally run places such as B&Bs, apartments or rooms for rent. Websites offering this kind of accommodation are popular (Airbnb, Couchsurfing, Homestay et al), and choosing one of these places will help ensure some interactions with locals—you get to talk with them, ask for advice, share points of view and observe firsthand their lifestyle and culture. The elements that make up a home reveal a great deal about the culture of its inhabitants: building materials, furniture, tools and the organization of the space, not to mention the daily activities and roles of a family. The way of preparing food, washing, dressing, eating, sleeping and killing time are all cultural aspects that one can easily glean by simply staying with a local family. A stay in a traditional house such as a Japanese ryokan, a Bedouin tent or a Masai hut is a once-in-a-lifetime experience. Yet it’s not necessary for the accommodation to be such a traditional structure, architecturally speaking—it can just be an ordinary apartment, a typical home with an average family. What matters is that the domestic environment represents the way of living of that particular corner of the world. Mass tourism has turned some historic districts into excessively touristy and often artificial places where one can hardly meet a local; nonetheless, this is where the cultural roots of a city are preserved. Castles, towers, temples, churches, mosques, palaces, buildings—aside from the aesthetic value of the attraction, with some more appealing than others—offer insight into a city’s history and can be key to understanding its present. All the cities with a relevant past usually have a local museum where visitors can learn more about the history of a place. Visiting these museums can be useful, though it’s not indispensable. Luckily, you don’t need to be a history or arts enthusiast to understand and appreciate a culture. I can personally attest that a walk around Rome’s historic centre, admiring the Colosseum and the other glorious monuments, would impress even the most indifferent visitor and teach them a thing or two. Certainly not all the culture of a place resides in its past and its monuments, but a good share does, no matter how many years have gone by. 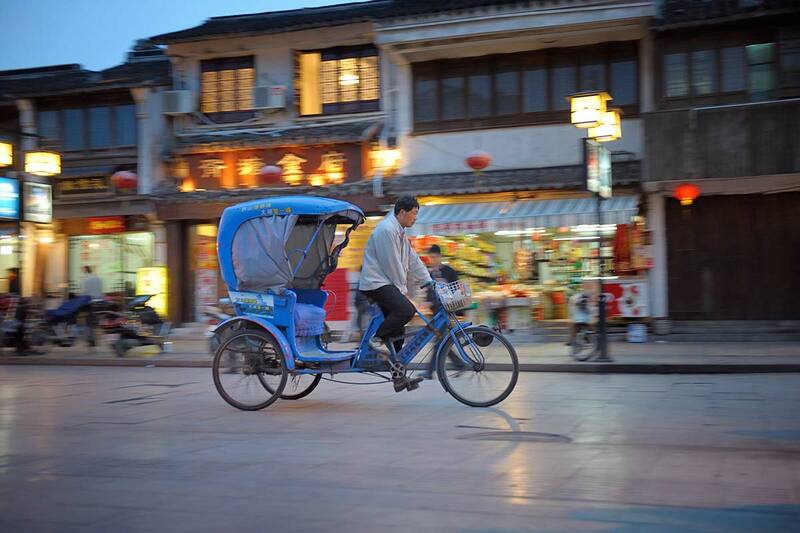 A rickshaw driver in Suzhou, China. Here I’m not talking about a specific place, obviously—but taking public transport the way locals do is one of the best ways to experience a city. The way in which mass transport systems are organized, yes, is typically determined by the geophysical characteristics of the area—but also by its cultural aspects. There must be a reason why there are thousands of rickshaws in Chinese cities, while in Italy so many people ride scooters. Taxis are more comfortable and in many countries affordable, but by sticking with them exclusively, you’d miss a lot. Travelling by bus or metro, on the other hand, offers you the cross section of a society’s ins and outs. And public transportation is the ideal location to observe people’s behaviour. While you’re effectively sharing this moment of daily life with them, you can pay attention to how local people dress, talk, communicate and interact; you can figure out so many things about their culture. Tokyo’s metro will show a totally different culture from New York’s; Mumbai’s train station will share little in common with its Berlin counterpart. Sometimes taking a certain means of transport is one of the most authentic and interesting experiences one can make in a foreign city. Personally, many of my most memorable travel moments came this way. How could I ever forget the cheerfully decorated, daredevil matatu in Kenya, the rickshaws zigzagging amid traffic jams in China, the multicultural show on display in New York’s Metro, London’s night buses packed with tipsy and noisy young people, the legendary Tram 28 and the elevadores of Lisbon or the ferry boats crossing the Bosphorus in Istanbul? Food is a central element of any culture. The way food is produced, sold and purchased, prepared and consumed varies greatly from place to place. It’s incredible how many things one can learn about a country or community just by analyzing people’s relationship to its food. 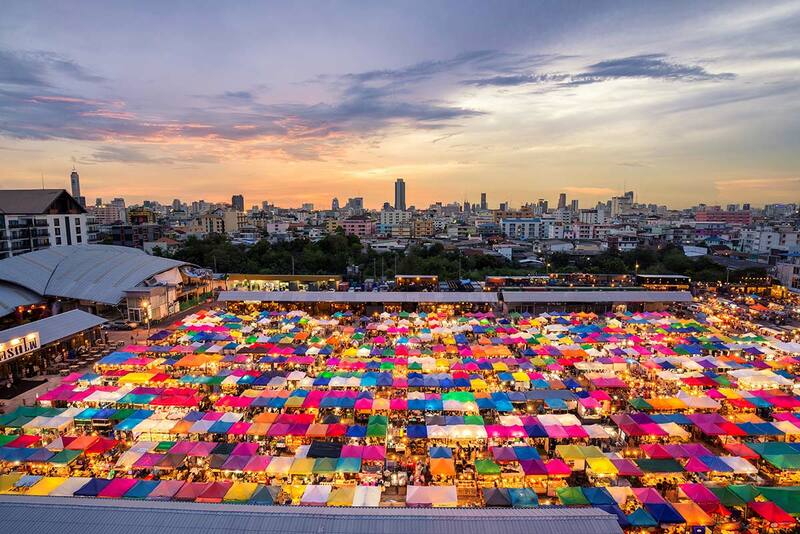 The Rot Fai Market in Bangkok, Thailand. One of the most stimulating experiences we can make in a city is going to a market. While browsing the stalls it’s important to have all five senses on alert, ready to grab the thousands of inputs raining down: scents, flavours, colours, shapes, sounds and noises. Restricting yourself to the role of passive spectator is really a pity. Besides seeing, you have to smell, hear, touch, taste and buy! When you find a product that you’ve never seen, don’t be afraid to ask the vendor about it. Generally, the presence of a language barrier doesn’t impede the communication—it actually makes it more fun. Markets, however, don’t only have food. The quantity and variety of products on sale in some markets can go well beyond your imagination. In many cases local markets are long-held cultural monuments or phenomena, and are included among the top attractions of a city: Istanbul’s Grand Bazaar, Bangkok’s Chatuchak Market, Melbourne’s Queen Victoria Market, London’s Camden Lock Market—the list is endless. I hope these tips have been helpful—they’ve certainly helped me to experience the best of local culture when I travel.